Researching female relatives is challenging. Often, they are listed as a first name or worse “Mrs. So and So”. If you are looking for records to help with your more current female relatives, look no further. 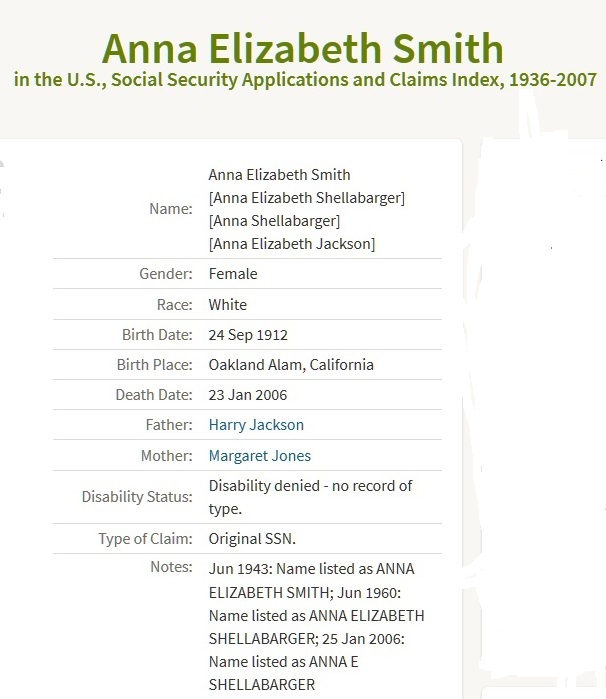 The Social Security Applications and Claims Index, 1936-2007 is online at Ancestry.com and it’s a winner! It didn’t take long for me to realize the importance of this database. If you aren’t familiar with the Social Security Application, it is the form filled used by a person to obtain a Social Security Number. This is so important because this document was filled out, in most cases, by the individual who was applying. The information is as they believed it to be at the time they applied. That last item is going to be important when researching female relatives. It’s sort of a history of name changes. If they reported a name change, it’s listed with the date the change was recorded. Be it marriage or divorce, the name change will be listed. There is a good chance to learn the woman’s maiden name and estimates of subsequent marriages. This is my grandmother’s application. Remember that the name on the application is the way it was the day they applied. Smith was my grandmother’s married name at the time. Included on the card are her birth date, birth place, and parents’ names. All this information was supplied by my grandmother as she believed it to me. Now look at the notes field. I’ve got a good idea what her name was when she applied, what it became after a subsequent marriage. All good information for tracking down more records. Entries give us clues as to how our relatives spelled their name, what they thought their birth date and birth place was, and who they knew to be their parents. It is rare that we get this kind of information given by the applicant. It may be the first time we see a record where our female relative supplied the information herself. Because of spelling variations, nicknames, and so forth, it can be difficult to find people. Be patient. Try surname searches. Try parent searches. If they were from a small place, try locality searches. Be creative. Remember that the original applications were handwritten, so information could be misread and transcribed into the database. Be careful with place names especially for Hawaii. They are recorded as seen on the application. Some are barely recognizable. There is that quirky problem where an individual claimed to be born in Honolulu, San Francisco, Los Angeles, Boston, and a number of other major cities, and it wasn’t true. Keep in mind that people tended to say they were from the largest, closest well known city rather than the one they were born in. This is a chance for me to find some of my Coyne/Dolan/Wall line in Boston. I also hope to find the maiden names of many of the women who married into my tree. I hate having unknown surnames on my chats. I’m all about filling in the blanks. It’s exciting to start a new research adventure, isn’t it? What will you find in this database? Not a member of Ancestry.com? Check with your local public library. Many public libraries subscribe to the Ancestry.com Library Edition. You may find more information about access on your public library’s website.